Advanced biomedical and industrial materials along with printing processes that are more environmentally friendly could be developed by a new type of nano-photoinitiator. Hybrid nanoparticles as photoinitiators. a. Electron microscope image of hybrid nanocrystal. The inset shows a schematic of semiconductor nanorod with a metal tip. b. Bucky ball structure produced by rapid 3D printing in water using HNPs as photoinitiators. c. Spiral printed with HNPs by two photon printer providing high resolution features. Adapted with permission from Pawar et al., Nano Lett. DOI: 10.1021/acs.nanolett.7b01870. Copyright (2017) American Chemical Society. A new type of photoinitiator for three-dimensional (3D) printing has been developed by Researchers at the Hebrew University of Jerusalem’s Center for Nanoscience and Nanotechnology. These unique nanoparticles could allow the production of bio-friendly 3D printed structures, and also promote the production of biomedical accessories and drive progress in standard industries such as plastics. 3D printing has now become a vital tool for fabricating varied organic based materials for different industries. However, printing structures in water has continuously been a challenging task because of the lack of water soluble molecules called photoinitiators. These molecules are capable of inducing chemical reactions essential for developing solid printed material by light. 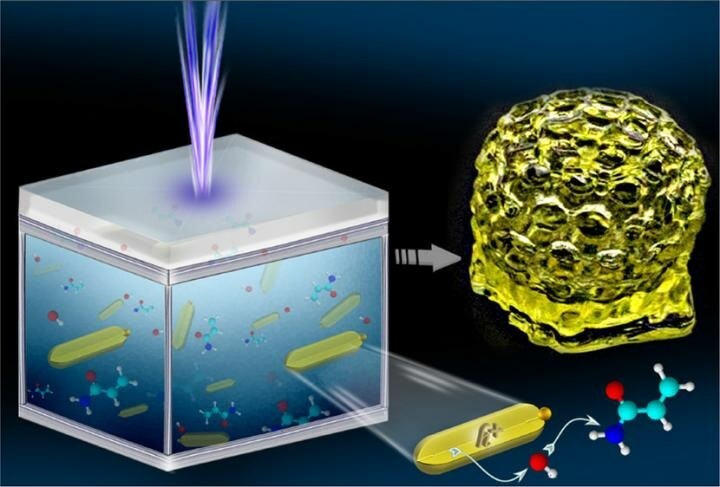 In Nano Letters, Prof. Uri Banin and Prof. Shlomo Magdassi at the Hebrew University’s Institute of Chemistry explain an effective means of 3D printing in water by using semiconductor-metal hybrid nanoparticles (HNPs) as the photoinitiators. 3D printing in water paves the way for exciting opportunities in the biomedical arena for printing scaffolds for tissue engineering and for customized fabrication of medical devices. For instance, the Researchers imagine personalized fabrication of artificial tendons and ligaments, heart valves, bone plates, joint replacements and various other artificial organ replacements. 3D printing in water also provides an environmentally friendly method for additive manufacturing, which is capable of replacing the existing technology of printing in organic based inks. The unique hybrid nanoparticles developed by Prof. Banin and Prof. Magdassi, unlike regular photoinitiators, present tunable properties, high light sensitivity, wide excitation window in the UV and visible range and also function by a unique photocatalytic mechanism capable of increasing printing efficiency while decreasing the amount of materials needed for creating the final product. It is also possible to use the whole process in improved polymerization modalities, such as two photon printers, which enables it to develop high resolution features. The research paper was published in the American Chemical Society (ACS) Editor’s Choice, where ACS provides free public access to new research considered to be of importance to the global scientific community, based on recommendations provided by the Scientific Editors of ACS journals from all over the world. ACS is the foremost publisher of peer-reviewed research journals in the chemical and related sciences. Prof. Magdassi is the Enrique Berman Chair in Solar Energy at the Hebrew University. Prof. Banin is the incumbent of the Alfred & Erica Larisch Memorial Chair at the Institute of Chemistry at the Hebrew University. The Researchers part of this study are affiliated with the Center for Nanoscience and Nanotechnology and The Institute of Chemistry at the Hebrew University of Jerusalem, in Israel, and the Institute of Systems Research and Department of Mechanical Engineering at the University of Maryland, in the United States.